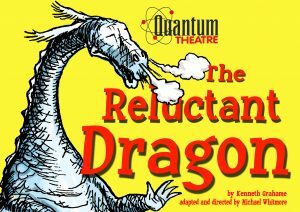 On Saturday 7th July the London based Quantum Theatre company will be visiting Holker Hall with their performance of The Reluctant Dragon. A pacey, action packed, humorous show for all the family, with live music – a fabulous chance to enjoy an unforgettable alfresco experience in a stately setting. The performance will be starting in the Holker Parkland (just over the wall from the Gardens with the Hall as a magnificent backdrop) at 6pm. Bring your own chairs or picnic rugs. “We’re really excited to have a brand new title ‘The Reluctant Dragon’ by Kenneth Grahame (of Wind in the Willows fame), adapted by Michael Whitmore. It will be pitched at families with young children and is a charming, funny and heart-warming tale involving a young boy and St George a very unaggressive poetry-loving dragon!” Quantum Theatre. Adult £11. Child £6. Family £30 (2 adults & 2 children). Tickets now available from Holker Hall – 015395 58328 and online at www.holker.co.uk. Special offer for the outdoor theatre evening: Wood fired pizza with salad £10 (adults), kids eat free! (Served from The Courtyard but can also be taken to enjoy whilst you watch the show!) Add a Prosecco or Peroni for £4.50. Free juice for kids. New for 2018 – Every Saturday from 3pm in July and August Holker will be having a ‘Pop-up Pub and Pizza in The Courtyard’ – good food, great ales and family fun (free entry).